Mohammad Ali Jinnah University (MAJU) Karachi is considered a top standard institute of higher learning in Pakistan’s leading universities by HEC 2018. 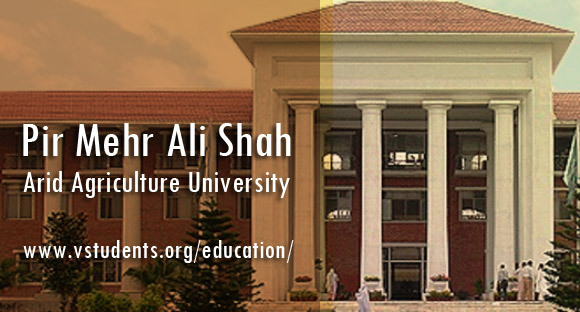 Which is situated in Karachi and sub-campus is delivering educational excellence in Islamabad, which has another great impact in the academic record with the name of Mohammad Ali Jinnah University Islamabad. Get admission 2018 in the institute which covers entire sections of education on graduate, postgraduate, MPhil and Ph.D. levels. Delivering knowledge regarding business management & commerce, applied sciences, engineering, medical science and about the square of computer science. MAJU Karachi is providing modern facilities to their students as well equipped engineering and medical laboratories, computer labs, air-conditioned classrooms, conference hall, a growing library, friendly and cooperative environment. More importantly, teaching faculty on the level of world’s famous universities and colleges. This reputable institute MAJU University Karachi is bringing you admission 2018 spring session in several departments including business, computer science, engineering, technology, telecom and Islamic banking in BS, MBA, MS, BSC, BBA, ACCA programs. Get enrolled yourselves and find the admission details for Mohammad Ali Jinnah University, Entry Test date, application forms last date, Scholarships, Merit Lists and schedule for depositing the fee dues in MAJU and admission criteria for all programs offered in 2018. The last date of fee submission for regular courses is given below. Admissions will start from 22 Jan 2018. Candidates are advised to submit application forms before the due date. Last date to apply for Entry Test: 14th July 2018. There are different fee structures for every BBA, MBA, BS and MS programs with graduate or postgraduate programs respectively. Candidates must follow the three different timings as well as fees for their relevant courses. Check all current courses like BSCS, BBA, MBA, MPhil, MCS, MS and Ph.D. fee structre here. See admission and entry test details for MAJU Karachi 2018 below. The MAJU Karachi offers you to submit your application forms in MBA in marketing and others. In this course, you will learn regarding marketing, finance, human resource management HRM, banking & finance and supply chain management from the dedicated and experienced professors of Mohammad Ali Jinnah University Karachi. The candidates must have their bachelor degree with 45% marks in the annual system of examination or got 2.5 CGPA out of 4 CGPA in semester system from any recognized college by Higher Education Commission HEC. BBA program is been offered by the department of business by Mohammad Ali Jinnah University Karachi where the students would be informed regarding marketing, HRM, supply chain management, banking, and finance. Only those candidates who have completed their HSSC intermediate examination by any board of Pakistan with the scoring of minimum 2nd division can apply for this program. The university is giving you offer to take admission in a trimester-based program of Saturday and Sunday classes in MBA and MS in MAJ University Karachi. This program will make you specialized in marketing, HRM, banking & finance, supply chain management and after completing this course you would be able to run your own business or do an excellent job in this square. The students having bachelor’s degree with second division may apply for this program. The timing of classes would be started 3pm to 9pm on Saturday and 10am to 5pm on every Sunday. You must have done your BBA 4 year’s program or equivalent degree with minimum marks of 45% percent from any registered university or colleges by HEC. 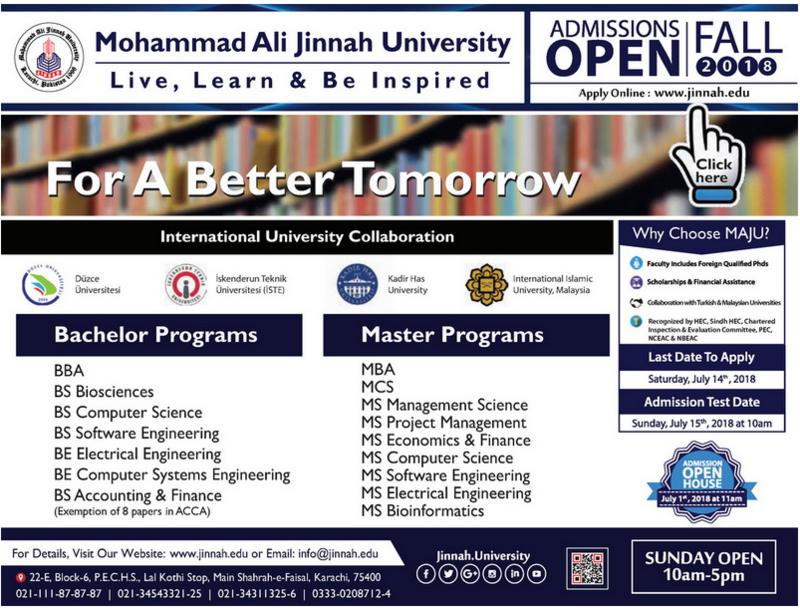 The Muhammad Ali Jinnah University Karachi gives you an option to get admission in various disciplines of computer studies and make your shiny future by many computer engineering fields under the world renown top-ranked university. You can submit application forms in any of the following programs. BS (4 years) computer & software engineering. BSc (Hons. 3 years) computer & software engineering. BSc (2 years) computer & software engineering. Eligibility Criteria for Computer Science in MAJU: The candidates having an intermediate degree with at least 45% marks are eligible to apply for above computer sciences programs. Application forms can be taken by the admission office of MA Jinnah University or the students can download session 2018 admission forms from the official website of MAJU Karachi. The applicants can check details of fee structure and more information from the site. Only those candidates would be called for entry test who would be filled their forms correctly. The merit list for successful candidates in entry test will also publish at the official site of MA Jinnah University Karachi and schedule of commencement of classes will inform you later via the website.